As the dark days begin to brighten, I’m thrilled to announce the launch of Hope Sings, a treasure trove of songs posted by Sarah Pirtle. The songs progress through the elements of the Spiral of the Work That Reconnects. Please read more below. Also below, a report from our annual Interhelp Conversation Day; news from our Tending and Mending the Web Action Circle; an announcement of our new Arts Resources web page; and an invitation to another open Community Day on April 14. During the very first days of spring, you can Dance the Spiral at Woolman Hill (March 23-25). And there’s still time to sign up for the February 10th Mending the Web of Life workshop in Greenfield. For WTR faciitators: A Community in Conversation Day hosted by Aravinda Ananda and Joseph Rotella on February 24 and a webinar series organized by Aravinda beginning on February 28. Both relate to the WTR “evolving edges” of power, privilege, oppression, trauma and intersectionalization. These [Work That Reconnects] workshops provide a time of nourishment and renewal, like coming to a well. People tap into their interconnection with all life and also have a chance to share their surfacing pain for the world. Feeling the sincerity of caring listeners, it is more possible to find voice, speak up, and go forth into action. At Conversation Day at Cambridge Cohousing, on a very cold January seventh, we happily greeted old friends and met a few new ones and journeyed together through the Spiral. Then Aravinda led us in a lively discussion about what community agreements we might want to have in place for this day, and for any given Work That Reconnects event. This process introduced a theme for the day, Tending and Mending our community web. More about this below. We also engaged in role plays, practicing how to engage in conversations that may be difficult, for which can happen if, for example, a workshop participant experiences or observes miscommunication or hurt happening. An explicit invitation was extended for anyone who might like to volunteer with Interhelp Action Circles, in particular Facilitation Deepening, Media, and Mending and Tending the Web. You don’t need to be a facilitator, or aspiring facilitator, to participate in Interhelp efforts to support a vibrant Work That Reconnects presence in our region (northeast U.S.). Contact us! We at Interhelp have undertaken a process of looking deeply at what kind of culture we hope to create at our events, how we can live into the ideals that we state, and how we will proceed when difficulty arises. The Tending and Mending the Web Action Circle (Aravinda Ananda, Carol Harley, Kristina Orchard, Sarah Pirtle and Paula Hendrick) is crafting a document to support this effort. Watch for an announcement in February, when the document-in-process will be posted on our website. We will be inviting, and hoping to receive, your ideas and reflections. On April 14 we will have another Community Day, continuing this exploration and engaging in a skill-building process. Details forthcoming. Visual arts, music, poetry, dance: All help keep us going! Please take a moment to explore the new arts resources section of the Interhelp Network website. It’s under the Resources and Musings tab. You will find links to the songs we sang at the Interhelp Gathering and lots of other wonderful music. But this is just the beginning. If you’re a musician, writer, or visual artist whose offerings relate to the Work That Reconnects, you could share your work on the website, too. Do you have ideas for how to include the arts in the WTR? Have you led a workshop or other event that uses art? Please contact Carol Harley to add a link, an image, or a short article. We’d like the page to be a lively resource that refreshes our spirits, connects artists to each other, and reminds us of the value of intuitive ways of knowing. A gift has been given to all Work That Reconnects circles, and in particular to the Interhelp Network, sower of WTR seeds for many decades. Hope Sings is a collection of songs offered by Sarah Pirtle. The songs are arranged to unfold as the Spiral, and are all ready for you to listen to and to download at no cost. Guitar chords are provided. Sarah includes background material on each song (57 songs by Sarah, three by others), and offers ideas about how to weave the songs into workshops. So far I have explored this treasure in two different ways, both of which I recommend. One is simply to browse through a Spiral section, listening to songs that might fit into (and make more powerful) an upcoming workshop or event. 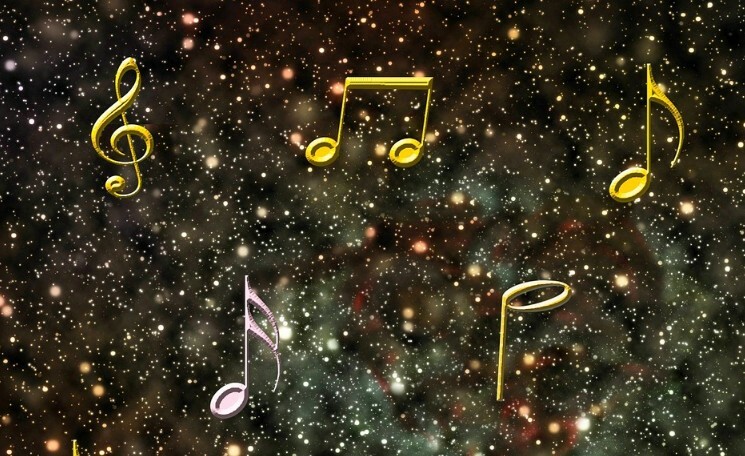 The other is to listen, in an unhurried way, to several or all of the songs in a Spiral section, letting thoughts and feelings arise as they may. In fact, the hours that I spent listening to the entire body of songs, over the course of three or four days, a couple of hours at a time, created a sort of reflective retreat. I felt myself deepening in my appreciation of the intention and possibilities of the Spiral. And I felt “comforted and connected,” as Sarah hopes that her listeners will. On my “retreat” I also read and mulled the written material provided with each song. Often Sarah tells the story of the time, place and people among whom the inspiration for the song arose. After a while I felt as though I were accompanying Sarah on her life journey of tending and mending the web of life in many places, among many different groups of people, over many years. By the way, Sarah introduces a new (to me) point in the Spiral, Calling Us In. This is something we always do as we open workshop space. I won’t say more: sample it for yourself! 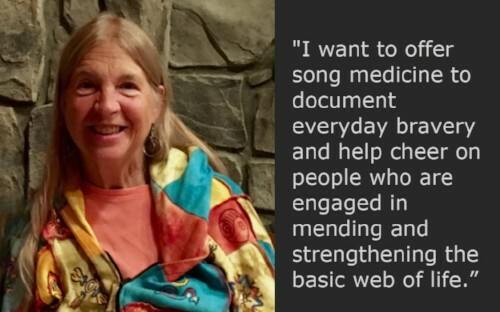 One more thing: I’m not sure I have found simpler and more spot-on descriptions of the Work That Reconnects – what we do, how we do it and why – than on these web pages, particularly in the “Using These Songs” section. This is not surprising, as Sarah Pirtle was an early developer of the Work That Reconnects. It seems that all of her efforts are in service of reconnecting, one way or another. Meet Sarah here. Click here to enter Hope Sings. Thank you, Sarah! I plan to offer a sort of “song of the month” in upcoming newsletters, sharing particular songs/stories from Hope Sings that are resonating for me. I’d love to receive ideas and submissions from your experience with this gift.